Just wanted to let you know the guys did a great job installing the grills. We appreciate it. They look great. Good job, kudos. Are you looking for a professional barbecue island design company? 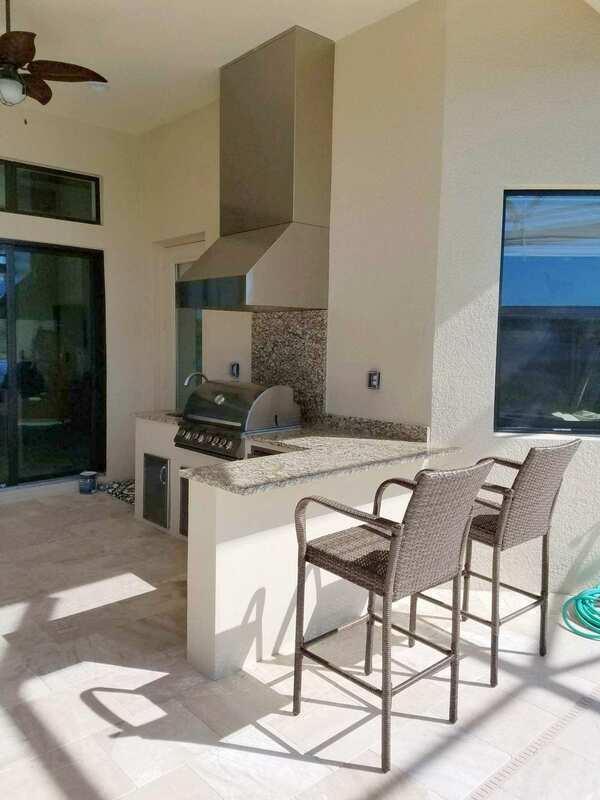 Elegant Outdoor Kitchens in Southwest Florida is quickly becoming the go-to outdoor kitchen company. We offer custom solutions that enable us to turn your outdoor area into a stay-cation destination. Our professional barbecue island designs will have your neighbors envious and your family wanting to spend a little quality time. All jokes aside though, Elegant Outdoor Kitchens offers superior custom outdoor kitchen design & manufacturing services that can’t be beaten. We design with your outdoor kitchen concept in mind! We’re a family owned and operated business that genuinely cares about our customer’s satisfaction. Our on-site consultation and design phase ensures that our clients get the exact outdoor living area they want. Our outdoor living specialists will provide 3D CAD renderings for your approval. We won’t start the outdoor kitchen construction project until you sign-off on the design. We’ll present you with different component configurations and layout designs. Our primary objective is to make sure you have the correct product information & understanding and a positive experience during the design phase. We can guarantee that our communication and customer service is a step above the rest. When you choose the pros here at Elegant Outdoor Kitchens, we make sure that you matter. We invite you to check out our customer project portfolio. 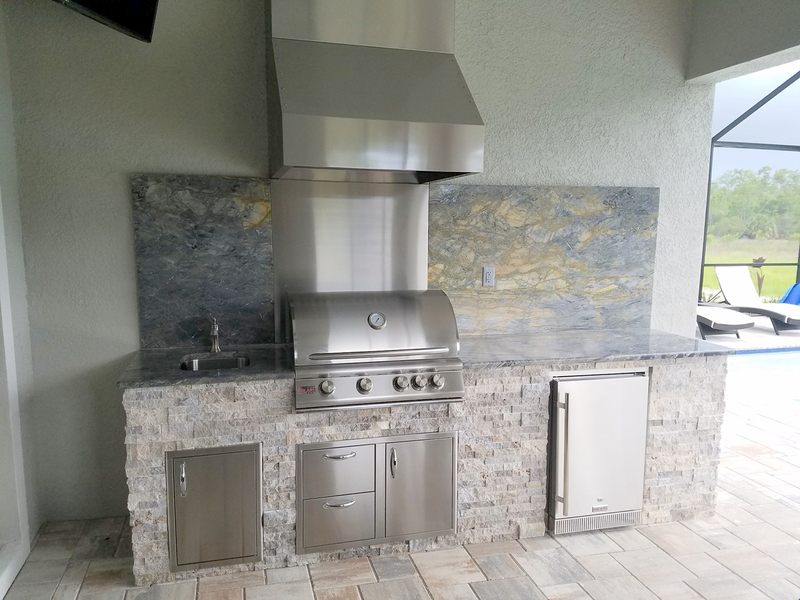 It’s not hard to see why Elegant Outdoor Kitchens is a leader in outdoor kitchen design & manufacturing in the Southwest Florida region. You can also give us a call or visit our official Facebook page for even more information about our company. The aesthetic appeal of your outdoor kitchen area is just as important as the overall functionality. In this article, we’ll cover some of the relevant topics you’ll come across in an outdoor living design & construction project. The first thing you’ll want to consider is the climate. Believe it not; this is one crucial factor that we address in all of our outdoor kitchen projects. Elegant Outdoor Kitchens uses only the highest quality of structural and finishing materials. We use products and materials that are safe and designed to work well with the Southwest Florida climate. The materials we use significantly impact the life and longevity of your outdoor barbecue island. Our outdoor living design specialists are here to guide through the design phase; we’ll ensure your choice of materials is adequate for our Florida climate. Please realize that now that not all construction materials are created equal. Before committing to a purchase of a particular construction material, do your homework. We recommend that you speak with one of our outdoor living design specialists, they’ll save you both time and eliminate any frustrations. Our team of designers is here to help you avoid costly mistakes. Average lows range from 65 °F (18 °C) in Key West to near 41 °F (5 °C) degrees Fahrenheit at Tallahassee, while daytime highs range from 64 °F (18 °C) at Tallahassee to 77 °F (25 °C) at Miami. Predominant tropical easterly winds across central and Southern Florida keep temperatures warm during the winter. Mild winters tend to be ideal for most outdoor kitchen products & materials used in its construction. Summers throughout the state are long, hot, and relatively humid. All in all, there aren’t too many limits when choosing materials for your barbecue island. The only factors that seem to be disadvantageous are the hurricanes and the humidity. A good rule of thumb for the Florida climate, choose finishing materials that have structural integrity and are not affected by prolonged exposure to moisture. Florida has seen and will continue to see its share of storms. This particular topic addresses the fact that your outdoor kitchen & living area must be able to withstand the wrath and onslaught of mother nature. Elegant Outdoor Kitchens has you covered when it comes to structural integrity and construction that will hold up to even the worst of storms. Our secure and durable construction is second to none. Our outdoor kitchen products are hurricane tested and approved. Give us a call today to schedule an on-site design consultation. Our professionals are here to help! We’ll answer any additional questions you might have about a new outdoor living project. Are you interested in seeing more of our custom outdoor living projects? Fantastic, because we have a whole lot of impressive project portfolios to showcase. Follow the link below to see our past work. View the Elegant Outdoor Kitchen Portfolio!